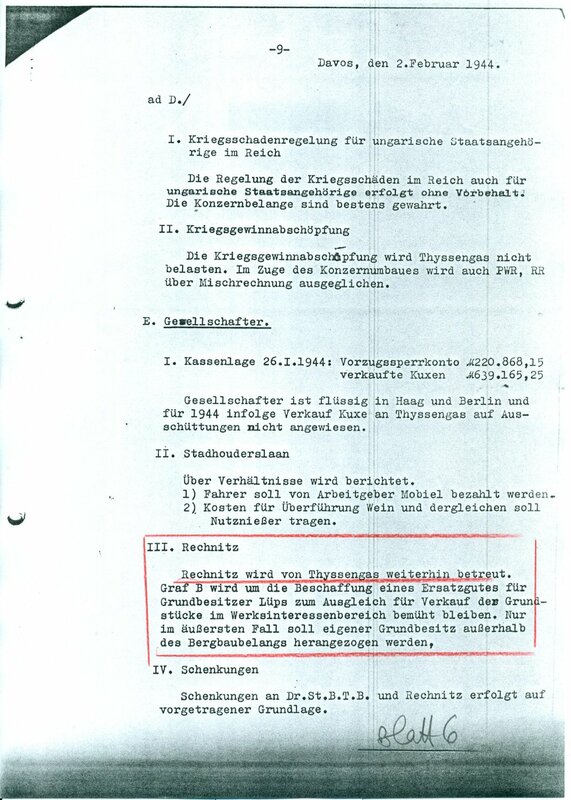 What have ThyssenKrupp’s historians been doing all this time? ‘Unfortunately, the title of this book is somewhat misleading, as of the 214 letters only 4 are by Heinrich Thyssen’s hand. It also does not limit the scope of its contents to the years 1919-1926 but includes furthermore a considerable amount of historical material on the history of the Thyssen family and its industries which has been written by Professor Manfred Rasch who is listed as editor of the book. 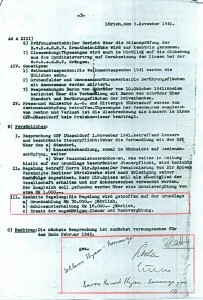 As Professor Rasch is also the head of the archives at ThyssenKrupp, it makes it difficult to accept the impartiality of his views. The style of the book is academic and thus requires an overwhelming interest in the subject matter, as much is being taken up with supportive material in the form of bibliography, sources, commentaries etc. One also gets the impression that this book, despite its size and the obvious complexity of the research, was in fact created in some haste, as on far too many occasions it sidesteps various historical issues by announcing that scientific research is still ongoing. 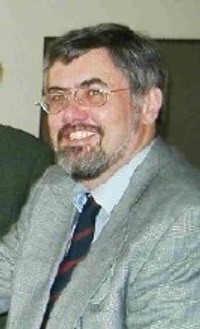 But what I find even more surprising is the way Prof. Rasch deals with other authors, some of whom have published considerable research about the subject, for instance the Briton David R L Litchfield (‘The Thyssen Art Macabre’, in German: ‘Die Thyssen-Dynastie’), whose description of the murder of 180 Hungarian slave labourers during a party organised at Rechnitz Castle by Margit Thyssen-Bornemisza caused a big stir a few years ago. Prof. Rasch suggests that his readers should view Litchfield’s book as mere entertainment: just an alarming error of judgement or a worrying example of professional jealousy? 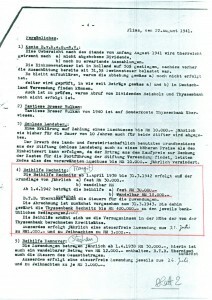 This is particularly disturbing in the light of the anti-Semitism in the Thyssen family (see letters dated 9.9.1919, 21.7.1923 and 30.7.1923) which the book presents to the interested public. All in all, however, this is a fascinating read which contains much material of interest to both amateur and professional historians’. One certainly gets the impression that the corporation may now be trying somewhat too hard to paper over the cracks in their historiography. You may no longer be able to see the cracks but you can certainly see where they have been, which only serves to draw attention to the papering. 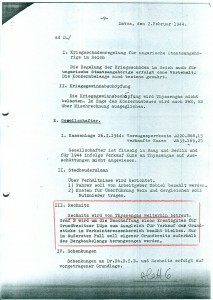 I was also particularly interested in the impression that ThyssenKrupp is now giving of having archives that are open to the public. This was certainly not the case when we were researching our book. In fact quite the opposite. However, Rasch still seems determined to believe that, having been denied access to his archives, we chose to create our book without documentary evidence. This is of course totally and completely inaccurate and an opinion that appears to have been based on his wishful thinking. Apart from the fact that our book is most certainly based on fully documented evidence, Rasch, who is obviously holding me responsible for the cracks in his professional credibility, would perhaps have been better advised not to talk of ‘entertainment’ in connection with a family that was responsible for the financing and use of slave labour, in particular (but not exclusively) in the context of the Rechnitz massacre (which Rasch chooses to ignore, apart from providing a link to an Austrian website). 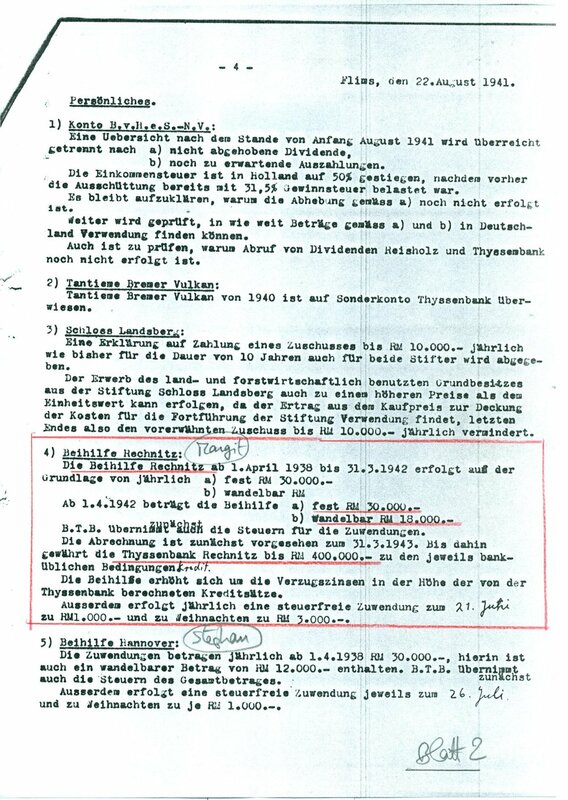 To assist Manfred Rasch with future editions of his book, I include in this post excerpts of documents confirming the Thyssens’ war-time financing of their SS-occupied castle in Rechnitz, documents which I can only assume he overlooked in his haste to publish his book. 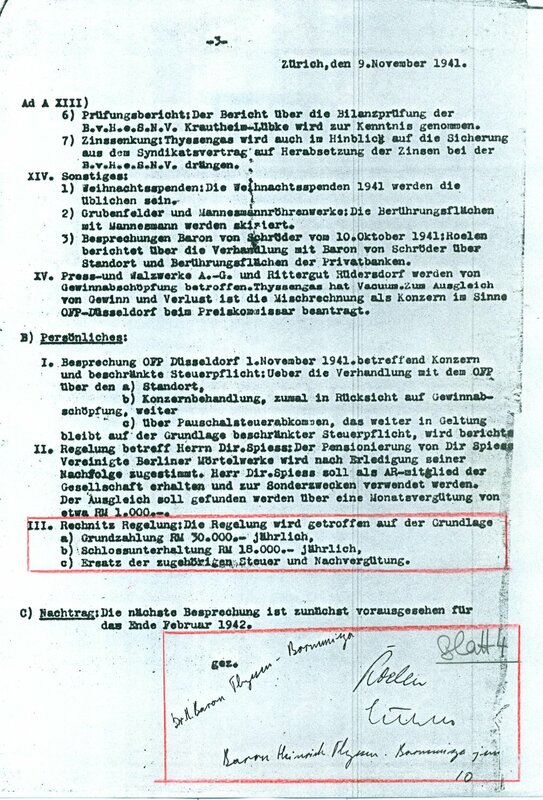 They concern meetings of Heinrich and his son Hans Heinrich Thyssen-Bornemisza (‘Heini’) with their managers Heinrich Lübke and Wilhelm Roelen on 22 August 1941 in Flims, on 9 November 1941 in Zurich and on 2 February 1944 in Davos and include details of the RM 400,000 loan from August Thyssen Bank Berlin to Rechnitz, yearly contributions of RM 30,000 for Margit Batthyany and RM 18,000 for the upkeep of the castle, as well as a notification that Thyssengas (then Thyssensche Gas- und Wasserwerke) was generally ‘looking after’ Rechnitz. (all excerpts of documents in this post are from the archives of David R L Litchfield and are to be reproduced with his permission only).